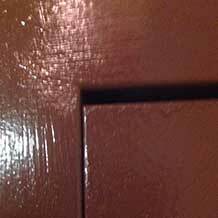 If your steel fire door has a gap larger than 1/8 inch, (+/- 1/16th), it is not code compliant. For both top and vertical gaps up to 1/2 inch, use the Crown Fire Door Stop System. For fire door gaps up to 1/2 inch on the latch side, use the Fire Door Stop Vertical System. For true smoke seal, use the Crown Fire Door Stop System. 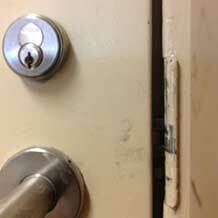 If latch engagement is an issue, add the Crown Latch Protector. 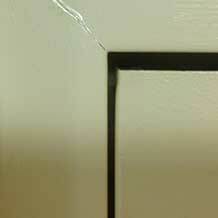 Excessive clearances at the top of your steel fire door may be remedied using only the Fire Door Stop Top System. For true smoke seal use the Crown Fire Door Stop System. 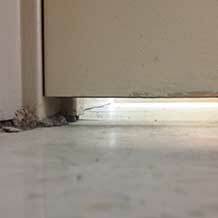 Excessive clearances at the center of steel doors swinging in pairs can be remedied using our Fire Door Stop System. Contact us if you need more information. For gaps of up to 2 inches at the bottom of your steel or wood fire door, use our fully adjustable Crown Fire Door Extension. Testing labs, like UL, inspect their "listed" products on a quarterly basis to ensure tested standards are maintained. 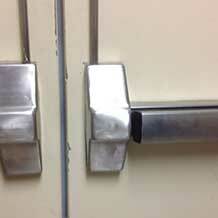 THE CROWN FIRE DOOR STOP SYSTEM IS TESTED AND LISTED WITH UL! The Crown Fire Door Stop System is UL approved for excessive clearances on wood and steel fire doors.The Crown Fire Door Extension has been UL approved to correct excessive undercuts on wood and steel fire doors. All Crown accessories are fire-rated for up to 90 minutes. Applying these products does not increase or decrease the fire door assembly's existing fire rating. No other products are UL approved, with a 90-minute rating, specifically for excessive clearances. Crown Fire Door Products, Inc.